After months of sleep deprivation, countless diaper changes, and about a million smiles and giggles, it’s finally time to plan your baby’s first birthday party. No, your child won’t remember the big day, but you will. And the photos with baby in a "1st Birthday" hat will be priceless down the road. Of course, these bashes are as much a party for the parents as they are for the child. It’s been a year of wonder, growth, and change—for everyone -- so celebrate. Old MacDonald Had a Farm. Set up hay bales as seating, dress your child in overalls, serve a farm-themed cake, give party favors in metal buckets (to resemble milking pails) and play Duck Duck Goose with the older kids. Circus Party. Delight your baby and all of your guests with the big, bold colors and entertaining ideas for this circus-themed party. Seasonal. Choose a theme that ties to the time of year, such as a Snowflake Party for winter babies, Sprinkles and Sunshine for a spring baby, Flower Power for a summer baby and Fall for Fall for an autumn baby. Hang handmade paper snowflakes for the winter party and serve snowman mashed potatoes and snowman treats. Suspend decorative umbrellas from your ceiling at the spring party and cover cupcakes with blue sprinkles to mimic rain. For the summer party, give Hawaiian leis as favors and set out a flower-shaped birthday cake. Serve owl cupcakes and foods made from pumpkin at the fall party. Cupcakes and Cocktails. Yes, real cocktails. The baby will never know! Throw the party in the evening, serve swanky hors d’oeuvres and offer grownups a cocktail that matches the party’s color scheme. The kids get mocktails. Set up a cupcake-shaped piñata (compare prices) or make a pin-the-candle-on-the-cupcake game. Serve cupcakes that are more classy than cutesy. Almost any kid-friendly theme will work for a baby's first birthday. Consider how you could adapt these birthday themes for younger guests. 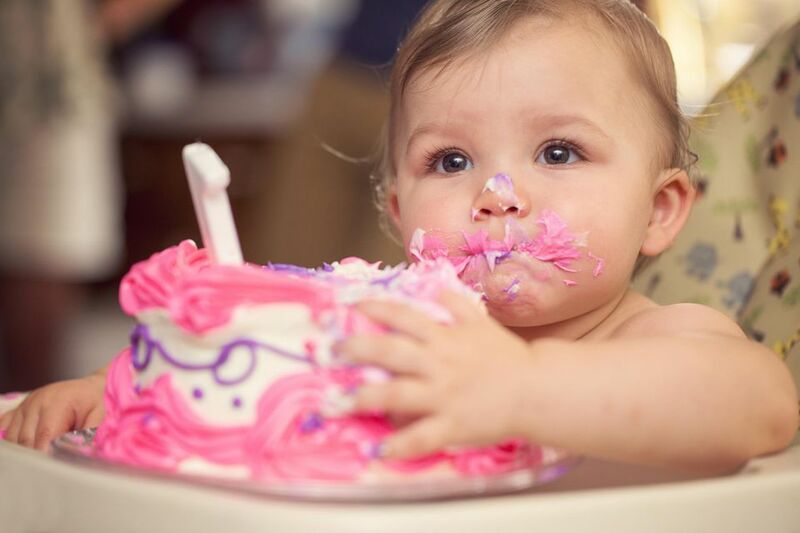 Some parents can’t wait to see the look of delight when their child takes their first bite of birthday cake--their first taste of sugar!--at their first birthday party. Another fun tradition is to watch a child blow out her first birthday candle. Be careful, though. One-year-olds tend to flail their arms about, especially when they’re excited like, for instance, ​when a room full of people are singing at them. Keep the candle far enough away during the Happy Birthday song that they can’t reach it, then pull it in close when it’s time to blow. Relax and enjoy the party. You've worked hard this year and deserve to have fun, too.